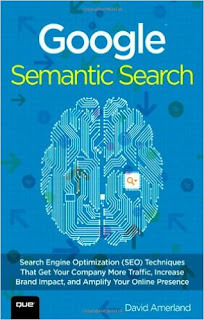 Semantic Search - Search Engine Optimization Techniques That Get Your Company More Traffic, Increase Brand Impact, and Amplify Your Online Presence written by David Amerland is a book about web/search 3.0. In 200 pages, the author provides a good overview of the new search norm for the marketing professional. Written in a slightly theoretical style, the books provides the nitty gritties of semantic search, it's components and how it all span out from search engine optimization perspective. If you were looking for a more in depth technical overview of how semantic Web or search works; you will be disappointed. I feel this book is written for a marketer in charge of various digital media, including SEO. The book is roughly written in three parts - first one dealing with an introduction on how search engines are transforming from a query engine to knowledge engine. The second part deals with how content marketing is driving new search marketing and how various channels such as social media get interlinked in building trust. The last part briefly discuss about how search is becoming more and more invisible and challenges in building an ideal knowledge engine. A brief overview of Google specific algorithms and components like TrustRank, Knowledge graph etc. Overall a good book, but I felt most of the topics are already covered in depth from various industry practitioners. Also keep in mind that some of the topics discussed may appear outdated, requiring refinement or irrelevant anymore because of the nature of industry. For example, the importance of Google + or rel=author tag.